It’s hard to believe the anatomically improbable old gal is 60 and none the worse for wear. She can still be found in play boxes all over the world -- at times with her head missing, matted hair and chew marks -- but no sign of sag in the rubber. From 7MAR to 21DEC 2019, guests can have a true “Barbie” experience at an exclusive suite at the Hilton Mexico City Santa Fe, with prices starting at US$189 per night on weekdays and US$229 per night on weekends. The room, which took 20 weeks to create, is furnished with a pink pool cabana, a life-sized DreamCamper and a collection of rare Barbies since 1959 when the doll was first created. Guests follow a special pink carpet near the front desk to access the room, right by a display of the doll’s shoe collection. 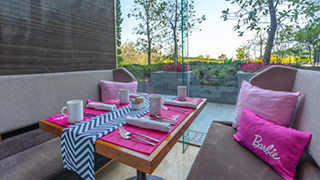 At the hotel’s restaurant, la Madera, travellers can dine from a pink-themed menu with dishes like heart-shaped pizzas, red velvet treats and strawberry ice cream to choose from. "Barbie loves to travel, enjoys nature and cares about the environment, without forgoing the comfort of the most sophisticated accommodations," says Andres Korngold, general manager of Hilton Mexico City Santa Fe, in an interview with CNN. "Travellers can now join in her dream glamping experience." Barbie made her debut at the American International Toy Fair in New York on 9MAR, 1959. Mattel, an American toy manufacturing company and the creator of Barbie, recently announced that it will be honouring Japanese tennis player Naomi Osaka and American actress Yara Shahidi with their own dolls as part of the 60th anniversary celebrations. Mattel has partnered with the Hilton brand on other projects in the past, like a Barbie-themed hotel room in Hilton Buenos Aires in 2014, and a Thomas & Friends pop up at New York Hilton Midtown in 2016.